The world’s first domesticated animals, sheep are non-predatory herbivores that typically live in flocks. These gentle creatures have an average lifespan of about 10-12 years. A young sheep under the age of one year old is called a lamb. Historians believe that man first domesticated sheep to be used as a food source around 10,000 BC. Today sheep serve as a major source of meat, wool and milk to many people around the world. In addition, soft sheep skins can be used to make clothing and other goods, while sheep’s milk serves as the foundation for a variety of cheeses, including feta, Roquefort and ricotta. Although the sheep population has declined significantly in recent years, there are still an estimated one billion sheep in the world. With many different breeds of sheep across the globe, these grazing animals come in a range of sizes and colors. Besides the domesticated sheep species, there are several distinct species of wild sheep. In general, sheep measure between four and six feet in length and stand two to four feet tall at the shoulder. As adults, female sheep, called ewes, weigh around 100 to 220 pounds, while male sheep, called rams, can weigh well over 300 pounds. At birth, most lambs weigh between five and 10 pounds. Wild sheep live in many parts of the world, usually in mountainous areas. Like cattle, goats, camels, giraffes and antelopes, sheep have cloven hooves. The shape of their hooves provides even weight distribution, enabling sheep to maintain their balance when they climb mountains and navigate uneven terrain. Some sheep need very little water, which makes them well-suited to arid desert climates. Because they are social animals, sheep do not like being separated from the flock. Sheep are a food source for many predators, and solitary sheep are much more susceptible to attack. Since sheep tend to follow the older members of the flock wherever they lead, they are fairly easy to herd. Because of the docile nature of sheep, in some parts of the world, the job of sheep-herding is often assigned to children. Sheep are ruminants, which means that they have multi-chambered stomachs that aid in their digestion of tough grasses, grains and vegetation. They are also cud chewers, a term that refers to animals that chew their food twice. When they first consume food, sheep chew it only enough to provide moisture before swallowing. Once the food breaks down in the stomach and forms a soft cud, the sheep regurgitates the food to be chewed a second time. During her first pregnancy, a young ewe is likely to carry a single lamb. Between the ages of three and six, ewes tend to carry larger litters. Twins and triplets are common, but multiple births can be harder on the ewe than single pregnancies. The gestation period lasts about five months. When ewes give birth, the process is called “lambing.” At birth, lambs are covered with a soft coat of wool. 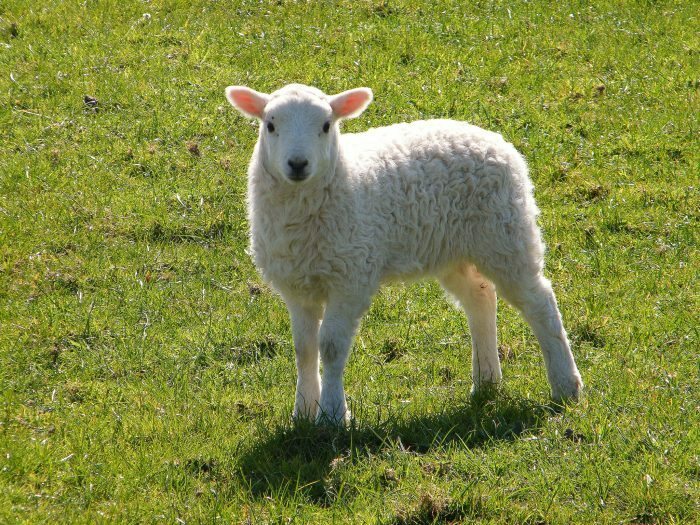 Newborn lambs are able to stand independently almost immediately after birth. In the first few weeks of life, lambs derive all their nourishment from their mother’s milk. If allowed to wean naturally, a lamb may nurse for up to six months. However, domesticated lambs are often separated from their mothers and weaned at a much earlier age. Premature weaning and separation can cause significant stress to both the lamb and the ewe. Depending on their breed and gender, some lambs are born with horn buds, which grow into a full-sized set of horns as the animal matures. In some breeds, both male and female sheep grow horns, while in others only the rams develop them. Every spring, a growth ring appears on the sheep’s horns. Counting the rings is a good indicator of the animal’s age. What Are Some Interesting Facts About Spiders? Koala: I’m Not Leaving You Mama!